1) We now offer faster international dispatch services - the majority of countries now have a 1-4 day transit time. Orders should be placed as early in the season as possible, especially for businesses in the USA & Asia. 2) Non-UK Buyers must accept any shipping fees incurred (these are cost price, no profit is added) - we aim to find the quickest, most reliable method of shipping and will provide options. You can request a shipping quote before ordering and/or we will notify you of the shipping price before we take any payment. 3) For orders to be delivered out-side the EU, VAT (a goods Tax of 20%) will be deducted from the price listed in the shopping basket. If you are in the EU but outside the UK and have a VAT number then VAT can be deducted. Again, you will be informed of the final total price, including shipping with VAT deducted, before we take payment. 4) Payments must be made in Pounds (£ GBP), which will be automatically converted when paying by credit card. You can also easily arrange a BACS/bank transfer/wire - if selecting BACS, you will be contacted with payment instructions on the invoice. Please e-mail if you have any queries regarding payment or shipping. 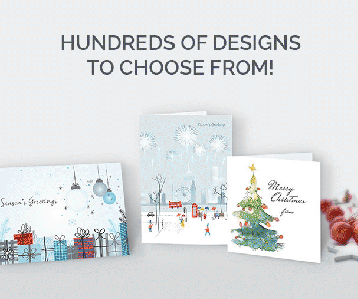 Click the View Christmas Cards button to view catalogue and order online! Company Christmas Cards are delighted to receive orders from outside the UK and stock a variety of designs that will be suitable to any corporate business in any country. We realise that many companies do not wish to offend non-Christian customers but also wish extend best wishes for the season and to wish them well for the following year - therefore, the majority of our cards feature a "Season's Greetings" message, as opposed to "Merry Christmas". EO&E Copyright © 2019 Company Christmas Cards.